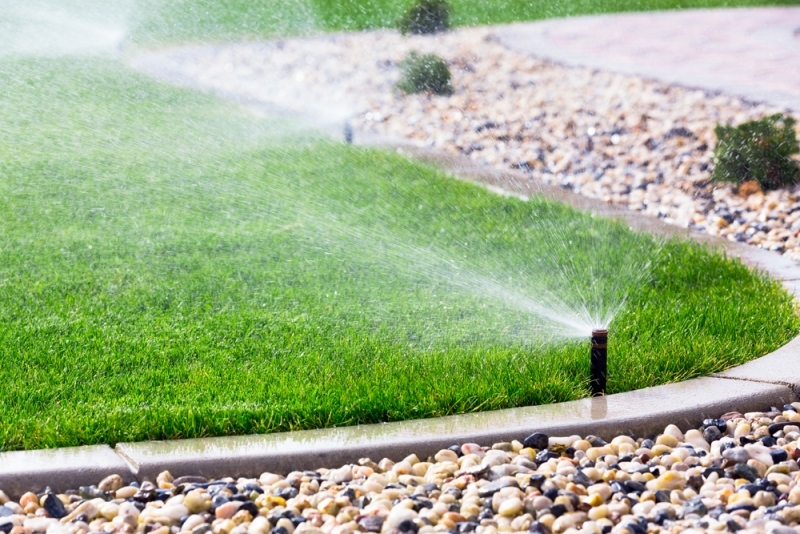 If you have an irrigation system, you should conduct an annual tune-up to make sure that you are saving water and money. There are several steps you can take to inspect your sprinkler system. Check for leaks. You will want to turn on each valve individually to see if any wet spots indicate a leaking irrigation pipe. Replace the battery. Look behind the front panel of the irrigation controller to check the battery. You will need to replace it if you’ve had the battery for a couple of years or if it is not fully charged. It is usually a standard 9-volt alkaline battery. The model of your panel may require you to loosen a couple of screws before gaining access to the battery. Note: If after a power failure the controller shows the incorrect time, you most likely will need to replace your battery. Replace broken sprinklers. Make sure that all sprinkler heads on a valve circuit are the same brand/model. With very few exceptions, most brands are not compatible with each other. The manufacturers purposely make the flow rates different so that you will buy their brand for your complete irrigation system. Once again, you will be wasting a lot of water. Note: In addition to not mixing sprinkler head brands on the same valve circuit, you should never mix spray-type heads and rotor-type sprinklers on the same valve zone. If you do mix, the grass near spray-type sprinklers will be over soaked, and the grass near rotor-type sprinklers will not have enough water. Clean spray-type sprinklers. Remove the nozzle from each head and clean the screen. The screen is under the nozzle so you may need to get a small hook or similar object to help pull it out. Clean the filter using a toothbrush. Put the filter and nozzle back on. Turn on the sprinklers to check that the nozzles are spraying evenly and are not partially blocked. If you suspect the nozzle is blocked, use a toothpick to clean it instead of a metal knife blade so you will not scratch it. But your easiest route may be to buy a new nozzle to save you the time and hassle. This is your best and most inexpensive way to tune up your sprinkler system. You would be amazed at how these small steps will lend significant results to a more beautiful lawn. When considering the best way to go about repairing a leaking irrigation or sprinkler system PVC water main, one must consider the level of skill and manual labor involved, have the proper tools and materials and exercise extreme caution at the work site. It is possible to save some money if you have the tools and materials on hand, but you may want to consider calling on a professional plumber who specializes in in-ground irrigation system repair. In the case of an emergency water main leak, turning off the water main at the meter can buy you some time and enable you to evaluate whether to endeavor to do the repair yourself or to call on a professional. Before you have such an emergency plumbing leak, take the time to locate your shutoff sprinkler system valve and develop a plan of action.